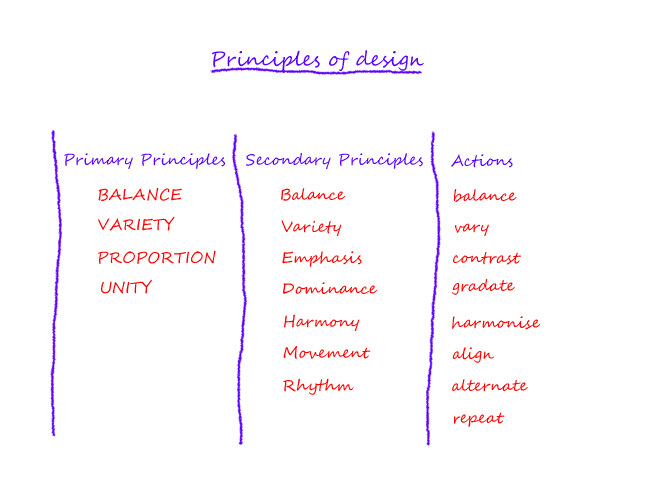 Design principles are organising principles. Applied systematically, they enable the artist to arrange the design elements into a hierarchical structure in which each element is subordinated to the design as a whole. The principles may be used to create emphasis, to establish focal areas in the design, and to direct the eye to these regions. The successful composition will have unity: self-consistency and appropriateness to whatever the artist is trying to express. Defining the principles is more difficult than defining the elements – which is reflected in the generous number of quotes; I’ve tried to canvass the opinions of as many sources as possible. Just as difficult is trying to find any sort of consensus over what to include in the list of principles. I could have added more – perspective and pattern, for example – but I’ve settled for those that crop up most often and are well documented. The final section of this article attempts to organize this list of principles into functional groups and then to explore how to get the elements and principles to relate in consistent, logical ways. Symmetrical balance is also described as static and is typified by many pre-Renaissance religious paintings. Asymmetrical balance is dynamic and is the usual form of balance in representational works. Colour – increase brightness and intensity. Whitney doesn’t explicitly list rhythm itself as a design principle but he does include the three forms of rhythm which Jirousek and others describe. These are repetition, alternation and gradation. Repetition (or regular rhythm) at its simplest is a sequence of identical design elements (motif) separated by regular intervals – in effect, a pattern. Repetition needs variety to avoid monotony. A series of identical windows in the facade of a building, for example, can be varied by showing some open, some closed; some with shutters, some without; some in darkness, some lit. Alternation is similar to repetition except the repeating unit is a set of elements which contrast in some way – dark and light, large and small, for example. Gradation (or progressive rhythm) is a sequence of gradual change in an element, suggesting movement. An example might be a line of fence posts progressively diminishing in size in a landscape. In this case, gradation equates to linear perspective. Several sources, including Jirousek and Vining, include a fourth type of rhythm, linear or flowing rhythm. I think this is defining linear rhythm as a stylistic quality of a particular artist. Since Vining includes progressive rhythm in her list of principles, flowing here is not synonymous with gradation. I’m guessing it means some form of linear rhythm. Rhythm is one of the most variably defined of the design principles in the descriptions I’ve looked at; Tersiisky and Whitney don’t include it in their lists at all. There is also a degree of overlap (confusion?) of rhythm with movement and pattern. Emphasis is the process of creating a focal point in a painting. The usual method of achieving this is to create or enhance contrasts between elements and properties of elements in the region of focus. Examples include contrasts of value, colour, shape and texture. Contrasts may be combined to increase emphasis: value and colour contrasts are often used together. Movement is typically defined as the arrangement of design elements to direct the eye along specific paths in the composition – often to the focal point. Jirousek (who classifies movement as an element rather than a principle) identifies two types of movement: static and dynamic. Static movement involves jumping from element to element and is ‘characterized by repetition of closed, isolated shapes and contrasts of colour and/or value’. Dynamic movement, on the other hand, is smooth, ‘guided by continuations of line or form, and by gradations of colour or form’ and ‘characterized by open shapes’. This idea of smooth and staccato versions of movement adds to the blurring of the boundary between the definitions of movement and rhythm. He relates harmony and gradation by pointing out that, although the extreme elements of a gradation may be ‘in violent contrast’, adjacent elements in such a transition are harmonious. He gives the example of a series of straight lines ‘falling’ from the vertical to the horizontal. By Whitney’s definition, harmony is the opposite of contrast; the harmonious parts of a painting will be the ‘quiet’ areas. In that sense, harmony, like space, is a negative concept – which may partly explain its frequent omission as a design principle. Alignment is a form of harmony which is restricted to the position and direction properties of elements. An obvious use of alignment is in the arrangement of blocks of text and images in publishing and web design, but it is also a common device in representational painting occurring both naturally as a consequence of the forms created by the subject matter and deliberately as the work of the artist. Variety was mentioned earlier in connection with repetition: variations in repeated elements avoid monotony and help keep the viewer interested. Variety applies to all of the design elements. One source includes variety and contrast as separate design elements: contrast is described as a ‘large difference between two things’, while variety is ‘achieved by using opposites or strong contrasts’. Variety, in effect, is just another word for contrast (or conflict or opposition). Most sources don’t include variety as a design principle. Proportion as a design principle is not concerned with the proportions of objects like people or architecture. Questions such as ‘Are the anatomical proportions of this figure correct?’ and ‘Is the perspective of this building accurate?’ have more to do with technique than design. Proportion is properly about the whole work; do the main divisions of the piece (in terms of colour, value, shape etc.) relate harmoniously? As a general rule, the division of elements should be unequal to avoid monotony. According to Whitney, dominance ‘resolves conflict and regains unity’; it does so most often through ‘repetition of an element or elements of design’. Looking at his examples, the principle essentially means making sure that there is always an imbalance – in terms of number or size, for example – between contrasting elements. So if a design consists of an arrangement of horizontal and vertical lines, to achieve dominance there should be more horizontal than vertical or vice versa. Alternatively, one set of lines could be made heavier (thicker) or darker in value than the other set. In some sources, dominance is synonymous with emphasis and the definition of a focal point. Unity is a principle that implies that other principles – balance, rhythm, emphasis etc. – have been used successfully to integrate all of the elements in a painting. Nothing appears out of place. Unity extends to the appropriateness of the design to the content or meaning it is intended to convey. Does the mood of the work, for example, reflect what the artist is trying to communicate? Whitney regards an artist’s style as a factor in creating unity. Technique, too, ‘can unify works by repetition of the character of marks or means employed’. This resource offers an excellent and comprehensive description of unity. Yes, that’s all there is to the principles of design. Piece of cake. Unfortunately, like some cakes, the principles have a tendency to crumble when you try to pick them up. Even if you’ve read the foregoing definitions carefully, how confident do you feel about applying them? Can you differentiate emphasis from dominance, or contrast from variety? Do you understand the difference between proportion and balance? And what about unity? Can you define it and how would you use it? Above all, if you were to decide to apply these principles in your own work, where would you begin? I said at the beginning of this article that the principles of design are organising principles: they are used to manipulate the design elements in specific ways. To use the analogy of grammar, elements are nouns and principles are verbs. Or, if you prefer a mathematical analogy, elements are the terms, and principles are the operators in an equation. The message is that principles perform actions on elements. If you examine each principle in turn, you will find that only some principles have actions; others seem to correspond to the results or effects of actions. A third group relates to aspects of the design as a whole rather than to manipulations of specific elements. This chart plots the groups. You’ll notice that some principles appear in more than one group: balance, for example, occurs in all three (the three versions are distinguished by capitalisation). This is actually consistent with the different ways in which balance is defined in various sources. It is an action principle when it affects the properties of elements; it is a secondary principle when it is the goal or result of an action; and it is a primary principle when it is applied to the overall balance of a design. element 1, element 2, element 3 etc. = e1, e2, e3 etc. In every case, an element or its property is acted upon by an action principle (or a sequence of action principles) to achieve one or more effects. Element 1 is repeated seven times. Positioning the repeats regularly can suggest Movement or Rhythm. Element 1 is aligned with elements 2 and 3. The align principle affects the position and direction properties of an element. Assuming the above statement affects both properties, it could be re-written to reference either position or direction, e.g. Element 1 is made to contrast with element 2 by changing its value. If the elements are adjacent to each other, this action might create a focal point through Emphasis. Alternate elements 1 and 2 five times. Movement could also be an effect of alternation. Pattern is mentioned as a design principle by a number of sources, although I haven’t included it in my list. I’ve suggested in Elements and principles: Part 1 that it may be regarded as an emergent property of specific configurations of design elements. Create a size gradient in elements 1 to 7. This might also imply perspective, which finds its way into some lists of design principles. Again, I prefer to regard perspective as an emergent property of element groups. Create variations in hue in elements 1 to 6. The object here might be to avoid monotony or to suggest Movement, possibly movement into the composition, i.e. to suggest depth. does not tell us precisely where to move e1. Even if we were to include the missing information (using, say, Photoshop’s numerical system for hue, or supplying the x,y coordinates for position), it would not alter the fact that the only way that we could obtain that information in the first place would be by trial and error – experimenting with the hue and position of the relevant elements in the actual composition until the result was visually acceptable. The statements above, fully specified, can only be descriptions of an existing composition, not precise instructions to create one. They are analytical rather than constructive tools. Each may offer perfectly good advice, but collectively they amount to confusion when you try to apply them.